i had been less than impressed with the last two mario RPGs i’d played (the “grandaddy” of them all, super mario RPG, and the wii snoozefest super paper mario), but i was still optimistic about the mario & luigi series which i hadn’t gotten to try yet. i started with the first entry, mario & luigi: superstar saga for GBA, which came out a couple of years after the first paper mario game (on N64). although from the bare description the game sounds like it would be very similar to the other mario RPGs, the dual-brothers mechanics really make the game feel fresh as in battle one bro is controlled by the A button and the other by the B button, making timing attacks and counterattacks much more active. 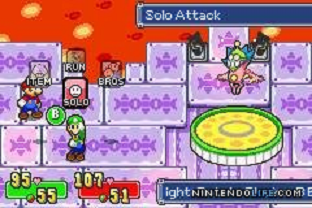 even aside from that, the action in battles feels quicker in general and battles feel less drawn out that in the other mario RPGs i’ve played, although boss battles tend to drag on. learning the counterattacks for all the enemies you encounter is pretty straightforward and reasonably worthwhile, although every once in a while an enemy’s attack will be unusually fussy. the bros’ super attacks are generally repetitive and boring, but otherwise battles work well and almost kept my interest to the end. the reason i say “almost”, is because the whole last third of the game really feels drawn out. by then the battle mechanics are really not offering anything new, and the last two dungeons are a chore. the last dungeon in particular reprises almost every mechanic seen in the whole game, which bored me almost to tears, particularly since the last battle (esp. the beginning of the second half) and what follows is incredibly cheap. the puzzles are generally entertaining and there are enough genuinely clever ones to keep the momentum going, and although the game follows the mold of padding RPGs with pointless mini-games, in general they aren’t too tedious and they’re staggered throughout the adventure. also, for the first time in a mario RPG i’ve played, the platforming segments, minimal though they may be, actually work, since they’re limited to very short horizontal areas. but all of this is ignoring the game’s biggest strength, which is the story and presentation. although other mario RPGs have been called “funny”, this is the first one that i felt was genuinely funny. there were so many memorable and fun, chuckle-worthy moments, and even when i wasn’t laughing out loud i was often surprised and amused by the story’s situations. the graphics are good (although the pseudo-3D effects can make judging enemies’ attacks in battle overly difficult), but it’s the characterizations that really make the world of the game come alive. prince peasley made me laugh pretty much every time i saw him, and fawful is a fun new villain. the game uses similar slapstick-like mimed reactions from its two main characters as in other mario RPGs, but here they’re even more pronounced, and to greater effect. i was especially surprised and gratified that my man luigi gets some special attention, even beyond his elevated status as a main character in this game. and due to its similarities to the mushroom kingdom, the beanbean kingdom feels somewhat less unnaturally foreign than some of the other lands the mario RPG games have visited. despite, frankly, disliking the last third of the game (which unfortunately prevents this game from achieving “legendary” status in my book), i’m really looking forward to trying out its two sequels. i should go back to the first paper mario game before then, though, although the next RPG i’m going to pick up will probably be a more traditional one. after a whole game’s worth of battles the battle mechanics of these mario RPGs feel too active, and for the next RPG i play i want to just be able to input the commands and sit back and watch them play out, haha. – the game is apparently actually heavily based on a japanese-only release by the same developer, alpha dream, called tomato adventure. interesting.